NYC Shop Originally Founded by Theosophists – Zero Equals Two! 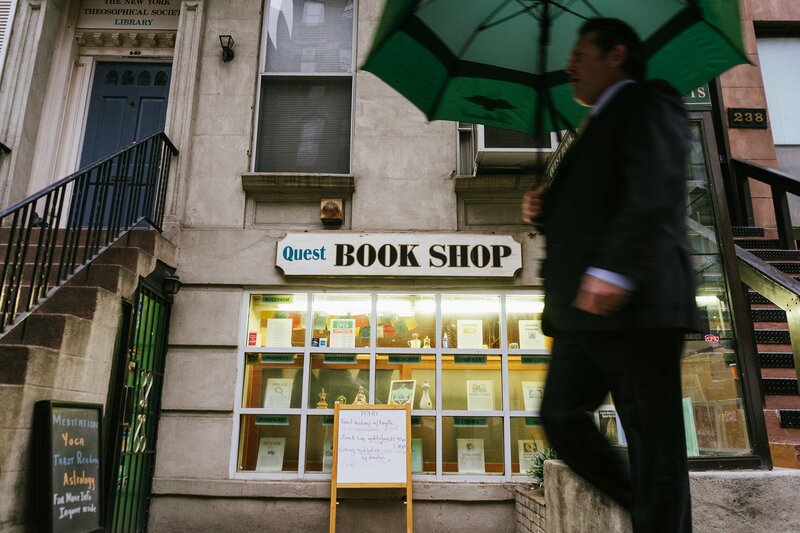 The New York Times “Neighborhood Joint” recently profiled the Quest Book Store which is located at 240 East 53rd Street in Manhattan. This is an old school metaphysical book shops what was originally started by the New York branch of the Theosophical Society back in the late ’70’s. Indeed a framed portrait of Madame Blavatsky hangs on the premises and on their shelves you’ll find a 14 volume hardbound set of her writings. And less y’all look down your noses as the Theosophists as being dated, fluffy-bunny occultism – Crowley counted Blavatsky as a member of the Great White Brotherhood and a spiritual forebearer. Years after her passing, he appealed to the membership of the Society to recognize him as the new World Teacher citing the fact that he was born the same year that the Society was inaugurated as a proof that he was. ANYWAY – as so many venerable metaphysical/occult themed shops like the Magickal Childe in New York, the Cauldron in Philadelphia have vanished, let’s take a moment to celebrate this one. and here’s the shop’s website: http://questbookshop.com/. Previous Article← The Dawn of Civilisation – the 2nd Great Error?